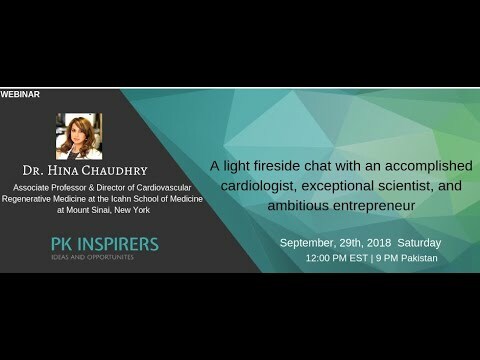 Dr. Hina W. Chaudhry is a cardiologist, scientist, and entrepreneur. She is currently Associate Professor of Medicine and Director of Cardiovascular Regenerative Medicine at the Icahn School of Medicine at Mount Sinai, New York. She holds a B.S. in Chemistry, a B.S. in Biology, a thesis in Physics, and a minor in Political Science from MIT, and obtained her M.D. with Honors from Harvard Medical School. She has won multiple awards in her field of cardiology including the American Heart Association’s Clinician-Scientist Award, an NIH Research Career Award, AstraZeneca’s Young Investigator Prize and was named TEDMED Innovation Scholar 2013. She was selected for the ‘Genius’ Edition of Esquire Magazine, won Best Manuscript Award from the American Heart Association, and the Sitara Imtiaz Medal from the Government of Pakistan. She is a Principal Scientist and Award holder of the New York State Stem Cell Board. In addition to her academic career, she is also Founder, Chief Scientific Officer, and Chairman of the Board of VentriNova, a privately-held biotech company based on her patent portfolio that is developing novel clinical treatments for cardiac regeneration.